Negative Impact of Tourism on Hawaii Natives and Environment. Darowski, Lukasz , Strilchuk, Jordan , Sorochuk, Jason , Provost, Casey . Lethbridge Undergraduate Research Journal. Volume 1 Number 2. 2007. Tourism represents a multi-billion dollar global industry. The increase of technology and transportation in the last half-century has led to the ease and availability of travel. The state of Hawaii offers warm climates, a cultural experience and extended leisure's to the ultimate travel consumer. While this growth has led to a prosperous economy, the impact it has had on the environment and Natives to the land, has proven staggering. The question of how to adapt in a period of rapid change has proven to be daunting. Hawaii has become a major tourist destination that receives over six million visitors per year. 1 It is a major contributor to the Hawaiian economy, so much so that it generates 10 billion dollars per year to the economy. Over the years this ever growing industry has reshaped the landscape of the Island with little consideration for the various sensitive eco-systems and the local native culture. Hawaii is home to some of the most diverse eco-systems in the world. The tourism industry has numerous negative consequences for the local flora and fauna. A major contributor to environmental degradation is the tremendous development of infrastructure relating to the tourism industry. From 1985 to 2010 the number of hotel rooms has been forecasted to double from 65 thousand to 132 thousand 2 . In addition, the energy required to sustain this development will increase the pressure placed on the environment. It has been reported that 60% of the animal and plant species in Hawaii are considered endangered 3 . The state has imposed laws and appropriate management policies to address this issue but it lacks the capital to enforce these regulations. Only corporate cooperation with the state government will protect and conserve the fragile environment. The ever increasing development of Hawaii combined with the strengthening tourism industry has led to Native Hawaiians struggling to preserve their culture. To meet the demand of this industry new hotels are continuously being built and expanded. “Almost every major resort development has been built on some culturally significant sight.” 4 A prime example of this is the Keonaloa development site where twenty two acres of burial grounds were relocated to a one acre plot on the property. This site was then built in the marketing strategy for the resort. This degradation of the environment is very important to their way of life as it is integrated into the cultural and social traditions. 5 Moreover, developing these properties has diminished the Natives ability to keep traditional livelihoods such as fishing, gathering food and medicine which, in turn, diminishes their meaning of life. Furthermore, with growing disparity Natives are reduced to a limited amount of avenues to satisfy their basic needs. 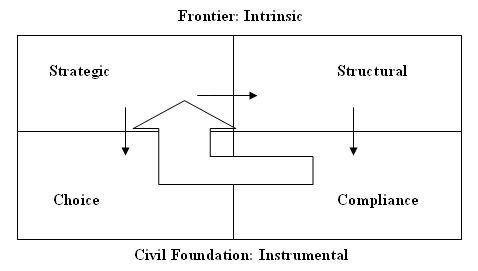 The Minimalist Model- in this model CSR is viewed as irresponsible and an unimportant issue. The chief concerns for an industry in this model are the profits that can be maximized. In using this view no inputs from stakeholders are considered and represent an opposing view to CSR and global concerns. The Self-Interested Model- This model suggests that an industry can be both profitable and responsible in the environments in which it operates. While this model considers corporate social responsibility, it still places profit maximization as its chief concern. Currently, Hawaii's views on tourism fall most closely into this model and show the largest similarities in how State operations are conducted. The Social Contract Model- when looking at the social contract model, the industry acknowledges that it has responsibility in every sector of business. When looking at Hawaii as a whole, the model must be adapted to not adhere to the obligations set but rather set the regulations and restrictions to which it operates itself. The Stakeholder Model- in the Stakeholder Model, all stakeholders and groups may influence the shape and direction on the industry. Applying these concepts to the tourism industry in Hawaii, it can be inferred that the industry has adopted a self-interested model. Given that the Hawaiian economy revolves around tourism, the impact of the industry has a trickle down effect on the rest of the stakeholders. Due to Hawaii being a remote destination this means that virtually everybody and everything on the island is interconnected and therefore affected by the industry. These stakeholders are categorized into three groups: the primary, secondary, and tertiary stakeholders. The primary stakeholders comprise of managers, investors, customers, creditors, suppliers, wholesalers/retailers, employees and competitors. These are considered to be primary stakeholders because they are the power base to all business activities. The secondary stakeholders are comprised of: the natives, local community, government, social activist and the media. Secondary stakeholders have indirect power to influence the actions of the industry through collaboration with primary stakeholders. 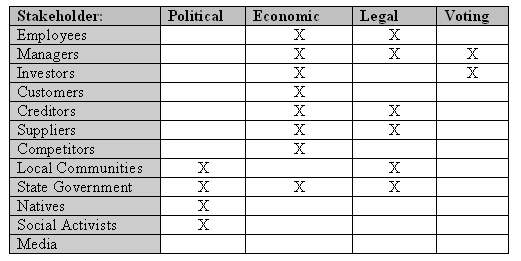 All stakeholders have respective amount of legal, economic, and voting power (appendix A). Within the levels of stakeholders, coalitions are formed based on common goals and objectives. Mapping coalitions will help the industry identify any foreseeable problems and design response initiatives. 7 In this instance the first coalition consists of Natives, local community, environment, the State Government, and NGO's. This coalition strives for the well being of the environment, the preservation of culture, and sustainable development of the industry. Presently the tourism industry has neglected to address the central concerns of this coalition. The second coalition is made up of managers, investors, and competitors. This coalition is mainly concerned with the overall dealings of their business which include healthy growth and profit maximization. Until presently the industry has mainly been concerned with economic benefits and held little regard towards the foundation of the first coalition's ideals. The third coalition encompasses the new breed of traveler whose beliefs and values are in line with that of the first coalition. In addition the more educated traveler has become more acquainted with the recent trend of eco-tourism. Eco-tourism is, “'Nature and culture based tourism that is ecologically sustainable and supports the well being of local communities”.8 The challenge for the industry is to provide a win-win solution for the various coalitions. Each stakeholder has a level of economic, political, and voting power. Through collaboration they can combine their sources of power and place greater pressure on the industry. For example, “On Maui, at a place called Honokua; developer excavations unearthed over 1,100 intact burial bundles, while local community groups protested in anger. It was only after mass demonstrations and strong community support that the developer was stopped and asked to discontinue the project.” 9 This example demonstrates how coalitions are able to combine their different power levels to achieve their overall objective. The extent to which each stakeholder cooperates with the industry and their potential threat to the industry will be assessed to develop the strategy matrix (Appendix B). This matrix will be the basis for how the industry should address the stakeholders. Natives, local communities, government, investors, media and customers all have high potential threat and high potential for cooperation. The industry should collaborate with these stakeholders to reach a common goal for all parties involved. Employees, managers, eco-travelers, state government, suppliers, and creditors all have a low potential for threat and a high potential for cooperation. The industry should involve these stakeholders in the formation of policies and goals. NGO's have high potential threat with little potential for cooperation; therefore the most effective strategy is to defend your business practices against these groups. Eco-tourism companies and competitors make up the groups that have low threat and cooperation. Due to the fact that they are competitors, they should be monitored to maintain a competitive advantage. The stakeholder analysis helps identify critical stakeholders. Moreover, it provides a framework for individual approaches for each stakeholder. Globalization has become more and more of a heated debate over the last few years. With the rise of multinational corporations and free trade agreements, we are seeing that national borders are becoming much more open therefore increasing the levels of interaction between these nations. Although the definition of globalization is as much debated as the effects, for the purpose of this analysis we will define globalization as, “the interconnections between the overlapping interests of business and society.” 10 Also for the purpose of this analysis it is important to interpret Hawaii as somewhat of a nation-state in and of it-self. Although Hawaii is a State within the United States, it is important to realize that Hawaiian culture is unique to that area of the world, and therefore independent and in need of protection from both global and American influence. In the past half of a century globalization has really become the driving force for many economies, the forerunner of this being Corporate America. This has led to growth within numerous industries, including the tourism industry in Hawaii. With investments mainly coming from mainland America and Japan, these two regions of the world have had a drastic affect on the cultural, environmental and economic well being, as well as played a role in government in Hawaii. Although foreign investment appears to be beneficial in that it has modernized the island and placed the resorts on a pedestal displaying a sense of well being, it has created strife for local communities. This however is far from reality for many Natives and residents of local communities. Granted wealth has been accumulated from the tourism industry in Hawaii, little to none of these profits have been passed down the chain of stakeholders. “While the few local elites and transnational corporations are the primary beneficiaries of a dominant tourism industry, Native Hawaiians continue to be the poorest, sickest and least educated of all people in Hawaii.” 11 This has inevitably led to a class division on the island that has threatened Hawaiians very way of life. Although the United States is at the forefront of Globalization this gulf that it has created between the classes is greater within the United States than any other nation. 13 However, this is a generalization as some parts of the country have gained, while other regions have been negatively impacted. Native Hawaiian culture is among the biggest issues when it comes to globalization and tourism within Hawaii. With all of the development over the recent years many Natives have found it difficult to maintain the livelihoods of their ancestors which to them, is a part of how they define their sense of self and well-being. With the loss of traditional jobs many have turned to the industry to make a way of life. This has led to the so called ‘hula' marketing, which quite simply is the sale of the Hawaiian culture. Although job opportunities are considered a good thing, there are negative factors that must also be considered. Jobs within the tourism industry are synonymous with low wages, meaning that many cannot support a family, let alone get ahead in life. Yet many are forced into accepting these jobs because if they do not the positions will be given to traveling workers. Lacking free choice many Natives have no alternative but to turn to crime as a means of making a living. Ironically enough, globalization and the tourism industry are destroying the very core of what they are marketing (Hawaiian culture), which will eventually lead to the complete incorporation of the Natives into modern society leaving transnational investors with one less commodity to sell. Furthermore, destroying a Native culture has a more devastating impact than depleting culture within Quebec. By globalizing the island and destroying Native culture we are also threatening their language. As English is the predominant language of business there are ever increasing pressures to make this the norm in Hawaii. Referring back to Quebec, if we destroy their culture they can always return to France to regain that language. However, in the Hawaiians case they are unable to do this as it is lost forever. Environmental issues are also a major issue related to globalization. Within Hawaii it is an especially important issue as Natives have incorporated it into social and cultural traditions. With growing development many ancient burial grounds have been excavated to make way for the modern era. All of this modernization needs a power source, which means new facilities were put in place for support. This implies that to sustain such development will perpetuate the pollution of Hawaiian forests and ocean habitats. Finally, the issue of government is another factor affected within globalization. Although governments are put in place for the well-being of those they are governing, their interests may not necessarily be in line with that of the Natives. Though culture and environmental preservation are important topics to the Hawaiian State government they also have a vested interest in the tourism industry. Essentially this means that not all decisions are made with Native or the local communities well-being in mind and business is still business. Overall the biggest and most important area of globalization needs to be that win-win situations are arrived at for the greatest amount of stakeholders. Diversity has been used to assist marginalized people since the Affirmative Action policies of the 1960's. However these types of measures appear to have overlooked Native Polynesians of the Hawaiians Islands. There is political change coming in the next few years that will give Native Hawaiians a political means to address and attempt to correct a lot of the wrongdoings resulting from their treatment since 1893. As Hawaiian lawyer John Goemans stated “There's no possible way that any thoughtful person can say that native Hawaiians are Native Americans” 14 . This viewpoint assists in making diversity a significant issue in the tourism industry on the Hawaiian Islands. In regards to the tourism industry consumers have and will continue to demand a more authentic experience; one that would be congruent with pre colonial times. A comparative example of this in Alberta is Head Smashed Buffalo Jump, where consumers get a history lesson in the lives of early Native Canadians. Tourists numbering over 80000 visit this site every summer, with a majority of the tourists coming from Europe and Asia. The tourist can request to numerous activities to enhance their experience such as camp-outs in teepees with traditional cooking, story telling, songs and dances from local First Nations. These types of tourist experiences and interaction are not strictly confined to First Nations in North America but are also taking place on the Hawaiian Islands with the Polynesian Natives. The use and exploitation of Native culture in promoting the Hawaiian Islands as one of the top tourist destinations has been used increasingly since the 1970's. The Tourism industry on the Hawaiian Islands is run with a very minimalist CSR view where stockholders, owners and the maximizing of profits are the main concern. There are a lot of similarities between the Native Polynesians and First Nations of Canada; each has seen their unique culture, practices and traditions used for marketing tourism destinations. The main difference between these two groups of Natives is that in Canada, First Nations fall under their own jurisdiction within the Canadian Constitution because of the Indian Act of 1796 and the numbered treaties signed there after. These pieces of paper even though they are of continuous debate by both First Nations and Government, have provided First Nations with natural resource and land rights. The Native Polynesians were not afforded the same rights and protections that were received by the First Nations of the mainland, which seem mainly due to the seemingly late overthrowing of the Monarchy in 1893. One of the long standing issues is the nearly two million plots of land that were ceded upon the over throwing of the Kingdom by the United States and the immense revenue that has been created on that land. If the Native Polynesians were afforded the same treatment as mainlanders there would have been a treaty or agreement signed that would have allowed them some cultural, economic and environmental security for the future. The Akaka Bill deals specifically with this issue of the treatment of the Native Polynesians of the Islands. The main aspect of the Akaka is, “The bill would allow Native Hawaiians- defined, in part, as anyone with indigenous ancestors living in the Island before the Kingdom fell-to elect a governing body that would negotiate with the Federal Government over land and other natural resources and assets” 15 . Ratification of this bill would give the natives a voice in current and future discussions regarding the use of land and natural resources in dealing with tourism development. This would give the Native Hawaiians similar recognition to the First Nations of mainland America and Alaska. This would give Native Hawaiians political means to address their concerns regarding the use of the land and natural resources for tourism and profits. The passing of the Akaka bill would greatly enhance the opportunities of the Native Hawaiians to have a greater positive impact on the Hawaiian tourism industry. The Akaka bill would also create and allow Native Hawaiians access to new social and economic entitlement programs to assist them in ensuring their people and their culture continue on for future generations to enjoy. The tourism industry will have to change its minimalist CSR view in regards to foreseeable political changes, as Natives will become a much stronger Stakeholder in future negations. In analyzing Hawaii and the effect that tourism has had on both the ecosystem and Native people to the land, we will use two separate matrixes. These tools will be used in establishing a workable structure and framework and help deepen our understanding of the issues. In order for these Matrixes to be properly applied we will apply them to Hawaii and its tourism industry as opposed to a single corporation or firm. While this shift appears to be the obvious choice to an industry that relies so heavily on its environment is further demonstrated with the application of the Efficiency Matrix(Appendix D). Developed similarly to the Virtue model, the Efficiency Matrix is also broken into four quadrants. The four categories represent high and low efficiency, as well as high and low enforcement. 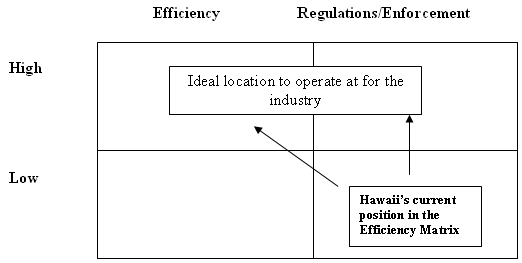 Utilizing the Efficiency Model places Hawaii's actions most predominately in a low enforcement category (Bottom right quadrant). On the Efficiency side of the Matrix, Hawaii's tourism industry has been extremely effective and produces huge profits for the state. In improving its CSR it is likely that in the short-run Hawaii's efficiency will decline. However, if Hawaii moved toward a more sustainable policy the long-term efficiency and benefits to the tourism industry would put it back into the highly efficient quadrant of the Matrix(Upper-left quadrant). 16 The analysis has shown the culture and environment are co-dependant to the tourism industry of Hawaii. Developing a stern policy of CSR sustainability is critical to the long-term survival of the state, as a profitable industry. The current trend towards eco-tourism in the market towards sustainable tourism has placed significant pressure on the industry. The tourism sector should adapt its business practices to coincide with the ideals of the new sector. Eco-tourism revolves around sustainable development and ethical business practices. Only through adapting this new paradigm of tourism will the industry create a win-win situation between the various coalitions. In a recent publication it was said that “eco-tourism is the fastest growing sector of the tourism industry.” 18 In 1999, “ecotourism was bringing in approximately $669 million of Hawaii's 10 billion dollar tourism industry.” 19 Hawaii needs to develop plans to capitalize on this trend and become a leader in the industry. In addition to the economic benefits associated with eco-tourism, this new approach places considerable focus on the local environment and community. For example, Maui Eco-Adventures is the winner of the 2005 Hawaii Eco-tourism Association operator of the year award. This company is identified with noteworthy growth coupled with a commitment to environmental stewardship and community enhancement. The shift from the traditional view of tourism to eco-tourism would force the industry to move from the self-interested CSR model to the stakeholder stewardship model. This new model of CSR places social responsibility as a corner stone for the industry. In a global environment where corporations should be held accountable for their actions, this model is helpful in preventing and solving CSR issues. One of the recommendations that we put forth is that all the major stakeholders including lobby, environmental, Native Hawaiian groups and Government officials put their support behind Bill S. 147, The Native Hawaiian Government Reorganization Act. The proposed bill accomplishes three objectives for Native Hawaiians: it creates an office to act as a liaison between Native Hawaiians and the Federal Government, sets up federal offices to administer programs designed for Native Hawaiians and provides the opportunity for the Native Hawaiians governing entity to increase their legal power. With the ratification of this bill into law the increase in political support and power of the Native Hawaiians would increase immensely. The resulting political change may be that they would become distinct in the Federal Government legislature as another Indigenous culture different from the First Nations of the mainland and the Inuit of Alaska. Additionally, any funding received will be considered separate from other Indian funding. Among the steps that will be taken if the bill becomes law will be addressing the land claims that have been a central issue within existing Native Hawaiian groups. During the defeat of the monarchy there was approximately two million acres of the kingdom land that was ceded; this land has created millions of dollars in revenue for the current owners as well as the state of Hawaii. The benefits of such a settlement would allow the Native Hawaiians an opportunity to support their members both socially and economically. Under the Akaka bill, positive ramifications such as possible land claims and federally supported programs, would allow Native Hawaiians the opportunity to support sustainable development in the future of Hawaii. Although the tourism industry is critical for the Hawaiian economy, the current propensity to grow cannot be sustained. The tourism industry places tremendous pressure on the local environment and culture. In order to promote sustainable development the tourism sector must abandon its traditional self-interested model and adopt the new stakeholder stewardship model. The views associated with this CSR model are embodied by eco-tourism. Through eco-tourism the Hawaiian tourism industry is able to provide win-win solutions to the issues addressed by each major stakeholder. 7. Weiss, Joseph. Business Ethics: A Stakeholder And Issues Management Approach. Australia; Thompson-South-Western. Page 37.